Jibe marks can be hairy because they bring a bunch of boats close together and then require their crews to perform one of the most challenging boat handling manoeuvres. Because of this, you can often make big gains or losses at jibe marks. 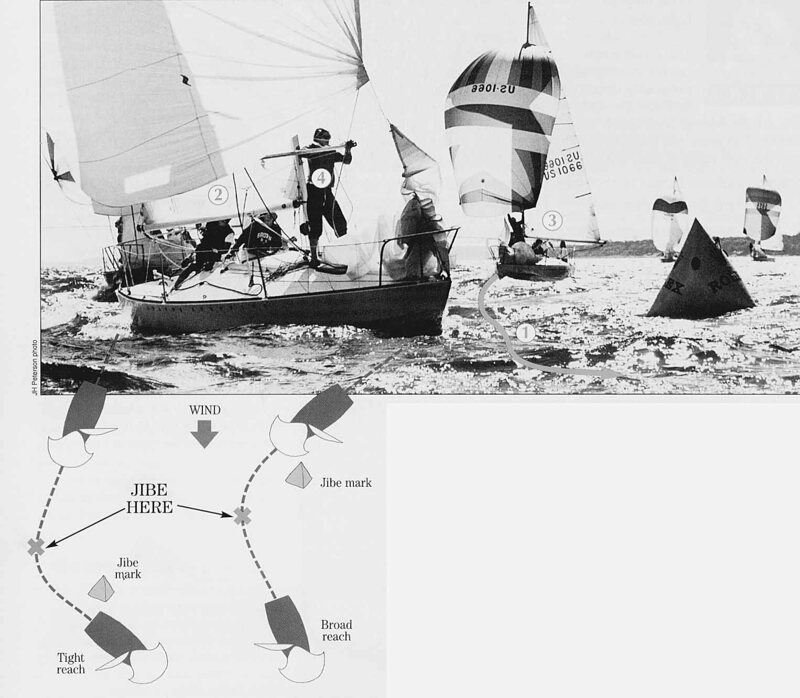 Like most sailors, I�ve had my share of bad jibes where I rounded wide with my chute collapsed and let a train of boats round inside and roll over me. To avoid this you need good teamwork between skipper and crew, excellent boat handling, clever tactics relative to other boats, and a smart strategic approach. Let�s see what we can learn from this great photo taken at a windy J/24 jibe mark. This fleet of J/24�s is rounding the jibe mark in a fairly strong breeze, turning onto a relatively tight reach. 1) In heavy air, steer an �S-course� through the jibe. To begin, bear off just far enough to make sure the boom goes across. As soon as you are on the new jibe, instead of continuing the arc of your turn, bear off again (making an �S� with your wake). This reduces wind pressure in the sails and minimizes heeling, which makes the manoeuvre much easier. 2) When you are turning onto a tight reach, try to get the pole on the mast before you pass the mark. This boat is too far behind in the process because they are already heading up for the next reach, but the pole is not in place. The bow person will have a tough time getting the pole in the mast, and this will hurt speed and manoeuvrability. 3) This boat has begun the jibing process earlier (which is possible because the first reach is fairly broad). They have a good chance of getting their pole in place before the mark. 4) In spite of a late turn, this bow person is in a good position to handle the pole. She is standing behind the pole, on the windward side of the boat, facing forward. Her feet are spread apart for balance and her hip is planted against the mast for stability. Her hands are spread apart on the pole for better control, and the pole is at chest height, which makes it easier to handle (than if it was higher). Strategically, the ideal place to jibe depends on the wind angle of each reach. When you're going from broad to tight (left), jibe before the mark. This way you sail higher (faster) on the slower reach, and you won't lose ground to leeward on the tight reach. When you're going from tight to broad (right), jibe after the mark so your speed from the first reach helps you gain ground to leeward on the second.